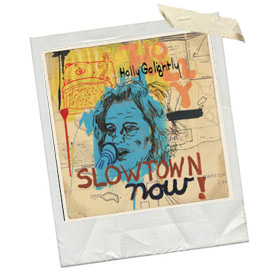 I thought I knew what to expect from Holly Golightly’s latest album, after seeing her playing a short support set in a London pub about 20 years ago after leaving Thee Headcoatees. Who knew that after over 20 albums in 25 years she has evolved, matured and become a whole lot more commercial ? Sounding like a sparky Debbie Harry on the opening track Seven Wonders Holly managed to keep me entranced like a star struck teenage boy, for the rest of the album. Back on seminal London label Damaged Goods Holly Holly has created a very ‘American’ sound to the songs and production here, which I wasn’t expecting from the one time stalwart of the London sub-Punk scene (or whatever NME had christened it at the time). I absolutely love the Chet Baker influenced Frozen in Time which comes quite early on and evokes images of a smoky Jazz dive in the part of town your Mother warned you against visiting. Producing the record herself Holly sounds so at ease on tracks like Slowtown and Stopped My Heart you’d think they made records together every three weeks instead of nothing since 2004. While the whole album feels warm and charming; the final four songs are all especially good; leaving my appetite whetted beyond belief. What You See and especially Forevermore come across as an artiste at the very top of their game; combining intelligent lyrics with a strong melody and chorus that have a retro 60’s feel to them but are pin sharp and very 21st Century. A difficult balancing act to get right; but Ms. Golightly does it with ease. Slowtown Now! Is a very accessible album aimed at music fans who appreciate quality fayre; and given a good wind and some more half decent reviews (apart from this one) this should easily find its way into numerous record collections from diehard fans, inquisitive people like me and hipsters alike.